Its ideal to find an on mountain timeshare property for your ski vacation week. Even better when you can exchange into a spacious condo, ski in ski out, with resort amenities like ski lockers, a pool and hot tub. Here are some of our first hand reviews of some RCI resorts we have stayed at in ski country. Christie Lodge at Beaver Creek is in downtown Avon, the local village for Beaver Creek Ski Resort. While not slopeside or super modern, The Christie Lodge is a great location for skiers. Suites are moderate size to small, many have been updated in their décor. The resort has a funky atrium with lounging areas, several hot tubs and tropical plants, and an outdoor heated pool and jacuzzi. Our one bedroom unit, while not palatial, was very adequate for the 2 of us, we would not want more in the unit, with a well-equipped kitchen, dining table, couch and fireplace, nice bathroom, king bed in a separate bedroom, and balcony. Christie Lodge is right on the free shuttle route to Beaver Creek, or you can grab a bus to Vail 20-minutes east. You can walk from Christie Lodge to a Walgreens for supplies, wine & beer, and 48 Vino – Avon’s best bistro for happy hour, also Blue Plate is right across the street door, and a Pho restaurant. Inside Christie Lodge is a Subway, for take out breakfast, lunch and dinner. Beaver Liquors and City Market are a short walk. Christie Lodge has a wine & cheese reception during the week, and family movies and activities. 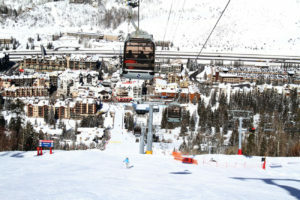 The Wren at Vail is a long 10-minute walk in ski boots to Vail’s ski lifts and apres ski at Vail village, but they have their own shuttle. Units here have been updated with Rocky Mountain decor. Our one-bedroom had a lovely fireplace living room and big kitchen – very well equipped. I was happy to cook on the big prep island with a view out the sliding doors to the balcony and evergreens outside. Ours was not slope view, but pretty. Our king bedroom was spacious enough and the dual vanity bathroom had ample room. An outdoor heated pool and weekly manager’s reception are the highlights at The Wren, otherwise the resort is quiet, except for adjacent I-70. 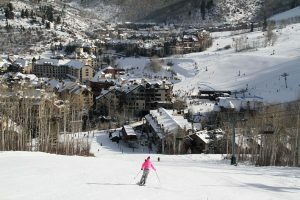 Copper Mountain Resort – Village Square condos have a choice location, steps to Copper’s ski lifts in the central village and the après ski bar, restaurants and shops in Copper’s cool Intrawest designed village. Units range in decor for recently renovated to older and dated. But again, the location is primo. A short drive to Frisco gets you a super market with supplies. We love skiing Copper’s high elevation terrain. 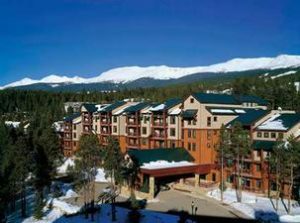 Beaver Run Resort and Valdoro Mountain Lodge at Breckenridge Colorado are both convienient properties, Beaver Run is directly on the slopes, with over 550 units spread across four huge connected condo buildings (ask for #4), all ski in / ski out, very family friendly, some rooms are nicer and newer than others. Beaver Run has several outdoor hot tubs viewing the slopes, its own ski shops, après ski bar – The Copper Top, dining and activities. Building 4 has its own slopeside hot tub and ski lockers. Valdoro Mountain Lodge (pictured right) in Breckenridge is the best appointed most luxurious time-share property we have ever stayed at. Very well-appointed, smaller, more posh. Very good location a 10 minute walk to town and very short shuttle to the Beaver Run Ski Lift. There are funky outdoor covered hot tubs and a heated pool, plus game room, spa and ski rental on premise. The Valdoro team is super friendly, they offer concierge, ski valet and short shuttle service to the otherwise walk-to Breckenridge’s ski slopes, and to downtown Breck for apres ski, shopping, and dining. shuttle (check the schedule) from “Lake at Big Sky” to Big Sky’s ski lifts and the village shops, Big Sky’s après ski and restaurants. 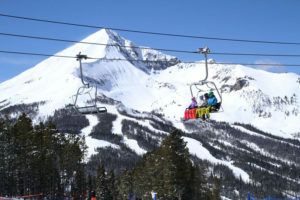 We love skiing Big Sky, and staying in a spacious one or two bedroom condo with a full kitchen, gas fireplace, and deck. Don’t feed the bear or fox…seriously! 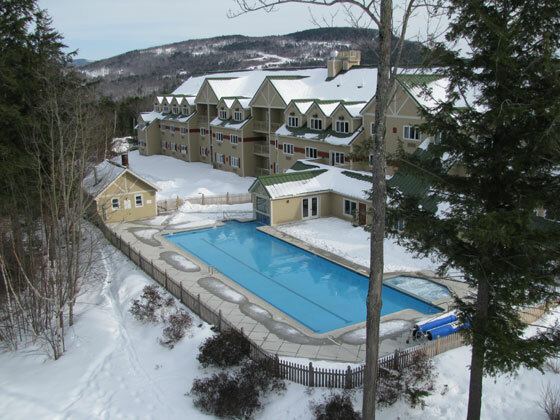 Sunday River Maine’s Grand Summit Resort Hotel offers slopeside hotel –style condo units, a huge outdoor heated swimming pool and hot tubs, the cozy Camp restaurant for breakfast, après ski and dinner, a mini-store and fitness facilities plus spa services. 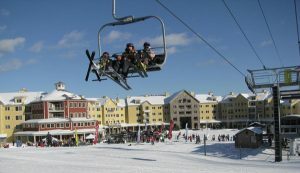 The on mountain location is convenient to Sunday River’s ski slopes, ski down to the Temptest quad, and back to the hotel at day’s end, to valet ski storage. Rooms vary from your standard hotel room to more spacious suites with kitchen facilities, living rooms, two and three bedrooms with balconies. 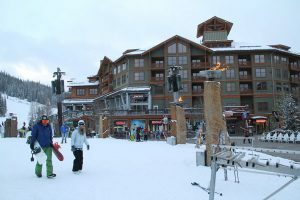 Sunday River’s Jordan Grand Hotel is another big hotel, with timeshare and quartershare units to exchange into, just note its at the far end of the resort, lift accessed during prime winter, but further away from Sunday River’s South Ridge village base. Sugarloaf Mountain Hotel in Maine is located in the heart of Sugarloaf’s village with commanding mountain views from most every well-appointed room. 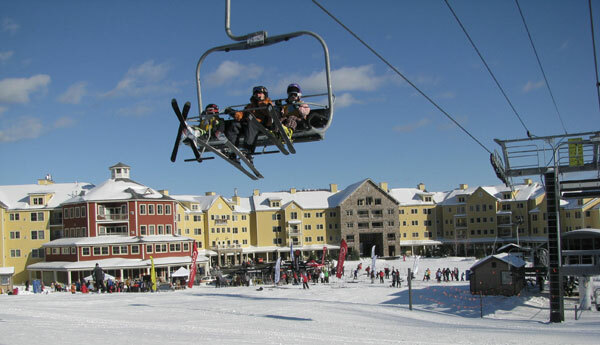 From the condo-hotel, you are steps to Sugarloaf’s SuperQuad and ski terrain (with ski lockers on the way), and all of Sugarloaf’s après ski bars like The Bag, and Widowmaker, shops and dining, and kids activities. The 30-person outdoor hot tub is a very social spot with a chairlift passing overhead, so Loaf! Smugglers Notch Resort Vermont is loaded with condos in the RCI network, of various vintage from 70s to new. As the top family ski resort in The East, Smuggs has activities galore, so the focus is on keeping your kids happy from ski camps to family après ski parties with mascots. The ski lifts at Smuggs are a time warp, slow double chairs, but the terrain is amazing. So don’t go to Smuggs for high-speed lifts, but exchange into this classic Vermont family ski resort for good times. Pub has a cozy après ski downstairs and a big f ireplace, or you can dine more formally at Seasons. The Viaggio Spa and Wellness Center has full beauty and massage treatments, or just head for the indoor heated pool, sauna and steam room, and the outdoor Jacuzzi. Also the brand new Riverwalk at Loon Mountain is an RCI property at South Peak, just across the river from the ski slopes, and a short walk to Lincoln’s shops, dining, and theatre. Jacks on Gore Inn at Okemo Mountain Resort in Vermont is a big condo-hotel, 177 suites, with underground parking, ski valet, great dining at the Coleman Brook, a beautiful fireplace lobby and bar, outdoor swimming pool and Jacuzzi and kids game room and activities. You are steps to skiing at Okemo’s Jackson Gore lifts on Okemo’s east mountain. Outside there are firepits, and the Timber Ripper for après ski family fun. The condo-suites are tasteful and modern. 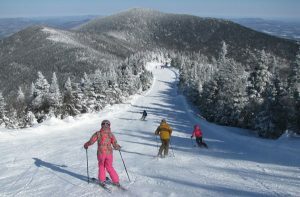 We love skiing Okemo and staying at this full service property. 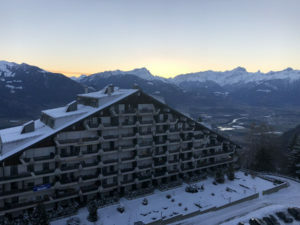 Residence Royal Alpage units are anything but fancy, picture 60’s vintage modest apartments but a great location in Champoussin – the heart of the Swiss side of the vast Portes Du Soleil. The reception desk is old and funky. Our one bedroom had an open loft with two twin beds, hardly enough head room to stand up, so we slept in the compact living room on the murphy bed, steps to the mini-kitchen where we could prep breakfast and après ski snacks, but making dinner would be challenging given the crude utensils and small counter. The balcony is the highlight, with a fantastic view of The Dents Du Midi, the jagged peaks that soar above the village of Champoussin. Residence has ski lockers downstairs, but no ski boot dryers. Internet is a charge of $20 Francs for the week. From your suite, you can walk downstairs to a convenience store, skip Les Caveaux restaurant – same management as The Residence. Note: Raclette Night on Tuesday at Les Caveaux offers live music as cheesey as the raclette served on small plates doled out one at a time with a tiny potato from the kitchen– hardly the big melty Raclette at your table served at most Swiss chalets. 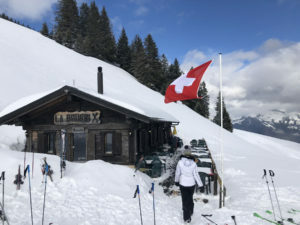 Instead a short walk to better dining is Le Poussin on the ski slopes for lunch or dinner, with a cozy bar, and their sister restaurant Amici for Italian. Or call the Gaby Mobile for a snow cat ride to Chez Gaby up on the ski slopes for fondue with a view. See the best ski chalet dining in Portes Du Soleil. Torgon Les Cretes at Portes Du Soleil is a 70’s vintage over-built condo development in these beautiful Swiss Alps. Seven huge buildings contain modest condo apartments, ours was spacious with a well-equipped kitchen and balcony, but the properties are no longer slopeside since the ski lift connecting Torgon to the Portes Du Soleil circuit are defunct (replacements in the works but could be several more years). There are two drag lifts for beginners in La Jorette, otherwise take the free bus 10-minutes up to Torgon’s ski slopes. Torgon at La Jorette has a grocery market, a ski shop, and two humble restaurants, an après ski yurt, and better dining at Bistrot down the road at Torgon village. For kids there is ice skating, sledding and a torchlight parade during the week. 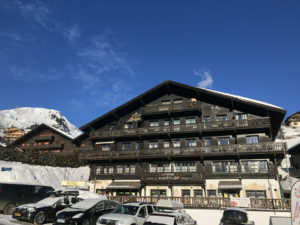 We loved skiing the Portes Du Soleil, especially the Swiss side, but lodging here you feel a bit out of the loop. We would not stay here again.